Millington, Tenn. February 17, 2017 – Indmar Marine Engines’ hard-earned reputation for delivering world-class quality and reliability across it’s highly acclaimed Raptor Series was reinforced again today – after the company was officially presented with it’s fifteenth consecutive Marine Industry CSI Award for excellence in customer satisfaction during the Industry Breakfast held at the Miami International Boat Show. The highly praised Raptor Series has now collected five prestigious and sought after awards; The BMI Innovation award, Boating Industry’s Top Products and now it reigns in on its third NMMA CSI Customer Satisfaction award. 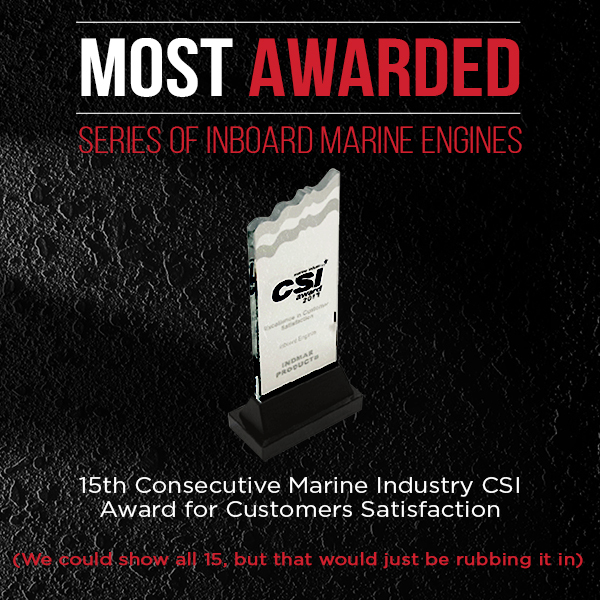 Indmar is the most awarded inboard manufacturer and has been awarded every year since the inception of the CSI program earning a total of 15 consecutive CSI Awards for excellence in customer satisfaction. This is a clear reflection of extensive company-wide efforts to deliver the best product in the marketplace and the kind of award-winning results that will make Indmar the most desirable engine brand in the eyes of consumers. The Marine Industry Customer Satisfaction Index (CSI) study, now in it’s fifteenth year, honors manufacturers that actively measure customer satisfaction and pursue continuous improvement to better serve the customer. Award recipients achieved and maintained an independently-measured standard of excellence of 90 percent or higher in customer satisfaction based on information provided by customers who purchase a new boat or engine during the period between January 1, 2016 and December 31, 2016. Indmar Marine Engines scored higher than 95% for 2016. National Marine Manufacturers Association (NMMA) is the leading association representing the recreational boating industry in North America. NMMA member companies produce more than 80 percent of the boats, engines, trailers, accessories and gear used by boaters and anglers throughout the U.S. and Canada. The association is dedicated to industry growth through programs in public policy advocacy, market statistics and research, product quality assurance and promotion of the boating lifestyle. For more information, visit http://www.nmma.org.